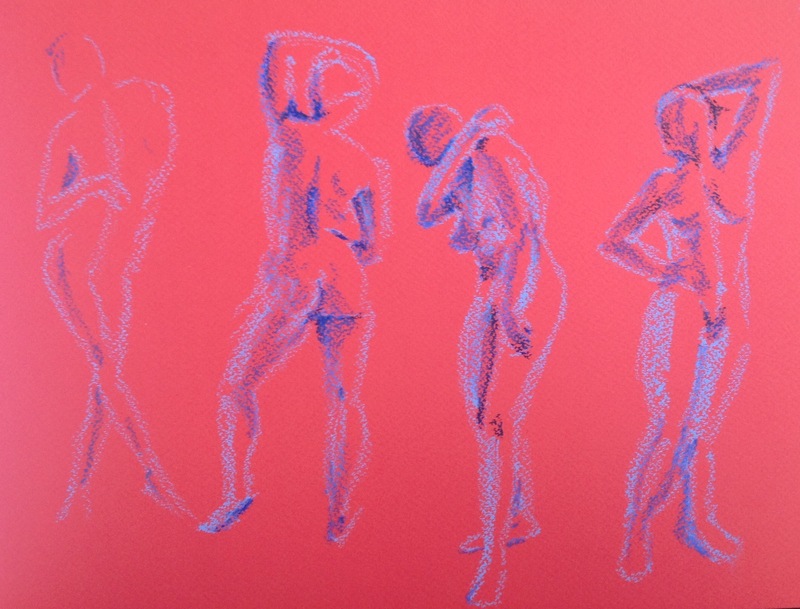 Lacking a model for this exercise, I used an online resource, ‘ Croquis Cafe’, for live figure drawing . I used with oil pastels and and tried to focus on the mid-line, drawing the position of the head first and drawing a curve to place the spine. I tried to stick to about 3 minutes for each pose. I feel quite happy with these images and like the effect of two tones of blue on the red pastel paper. I continued with a second model, this time trying pen, pencil and charcoal pencil. I’m not sure why these were not as successful – maybe using a finer point restricts me from making quick gestural marks and not getting caught up in details of models forms which is difficult to do in the time.